It was thanks to Steve Mccomish at Pressman PR (who I thoroughly recommend by the way - he's amazing at getting media coverage - www.PressManPR.co.uk) that I recently met an exceptional man called 'Robbie Burns'. 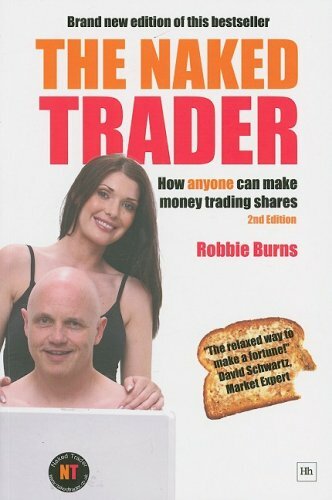 You might have heard of him - Robbie is 'The Naked Trader' and runs www.NakedTrader.co.uk. Quite simply, he is a super-bright, massively successful, hugely engaging guy, who has cracked the secret of not having to work for anyone else. Oh and he's throughly charming too! Anyway, we met in a bar and had an exciting meeting. Robbie's business acumen is mind-blowing, and he's also approachable, helpful and fun too, which is rare and wonderful to find in the business world. I met someone in a pub yesterday... and this time I managed to actually meet the person and find the right pub!! The person I met is a lovely chap called Sheridan Simove (prefers to be known as Shed). Maybe cos he's got Shed-loads of ideas. Which is his thing - ideas! He's just had a book published called IDEAS MAN, more on that shortly. His main claim to fame is that a while back he hit the front pages of all the tabloids. He was the 30-year-old who posed as a 16-year-old and went back to school for a TV documentary. You probably read about it. That took some guts but he pulled it off. He does a lot of TV work but his main thrill in life is thinking of new ideas and then finding ways - usually a bit crazy - to make them happen. I guess what he does is, instead of going on Dragons Den with his ideas, he has literally so much belief in his own ideas that he's brave enough to get his ideas made or produced and then sold. And interestingly I feel it's not all about making money - it's about the satisfaction of having a business idea and then seeing it through to its conclusion. There's nothing like walking into a shop for him and seeing one of his products on the shelves. Shed is one of those people who are keen about everything they do - and I love people like that. His book "Ideas Man" is all about the hundreds of ideas he's had.. and how he had to battle from scratch to make these ideas become a reality. Instead of most of us who have ideas then can't be bothered to do anything about them Shed literally knocks down doors to get them in. Rather than asking the Dragons Den bloke to do it all for him. And boy he does really well - so far he's managed to get tons of his ideas into the shops - from adult sweets to mini books to my favourite - control a man and control a kid remote controls! He's also the man behind a number of TV shows. He shows how with determination and effort you CAN achieve whatever you want. If you're a budding entrepreneur his book is a must. He reveals how to get ideas marketed. And I was absolutely gripped by the chapter about how he pretended to be 16 to find out what it would be like to have a second chance of going to school. It's almost like a thriller and even my bath water turned cold! The terrible battle he had to keep the secret while pretending to be a pupil, the near misses and then the final quite painful end to story are quite fascinating. It would actually make a really good movie. Give it a read, it really is good - especially the chapter about the school. Oh, I forgot if you fancy buying one of his ideas now in stores - the remote controls (Control a Kid, control a man or control a woman) - they're very funny, only around a fiver each and would make a great silly present. And that's probably enough plugs for Mr Shed for now!